Bonham consumed 40 measures of vodka in just 12 hours. John Paul Jones: 'We tried to wake him. [Dead] It was terrible. I had to break the news to Jimmy and Robert.' Read about how John Bonham died. 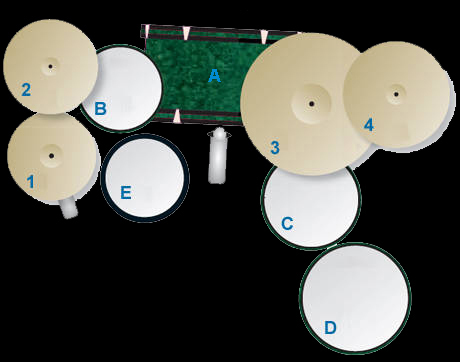 NEW: John Bonham triplet drum tutorial. By early 1968, John Bonham had built up a strong reputation amongst musicians and bands in the Redditch area for being one of the best drummers around. He had the combination of power, stamina, technique and stage presence that made him stand out. Robert Plant recommended John Bonham as a potential drummer to join Jimmy Page's new group. Page and manager Peter Grant went to check out John's drumming first hand at a Tim Rose concert which took place at a club in Hampstead, North London, July 1968. Jimmy was impressed and invited John to join Led Zeppelin. However, around this same time John had also been receiving other tempting offers from esteemed artists such as Joe Cocker and Chris Farlowe who were in positions to offer John more financially lucrative prospects. Plant and Grant bombarded Bonham with telegrams of persuasion (eight from Plant and fourty from Grant) sent to John at his favourite local pub: 'Three Men in a Boat' in Walsall. Bonham finally decided to accept Grant's offer, joining the band in early September 1968. Bonham said: "I decided I liked their music better than Cocker's or Farlowe's." Listen to the BBC's documentary narrated by the drummer Dave Grohl. Watch an interview with the great Led Zeppelin Drummer from 1970. Have a look around and have fun!